Last Updated: February 2, 2018 | Subscribe to our weekly newsletter! Whether you have a brand new hot tub or you haven’t used it in a couple of months, making sure the water is safe and clean is paramount to enjoying a long soak. If it’s your first time starting a hot tub, you might feel a little overwhelmed. If you slacked a little on your spa maintenance, you might be struggling to remember everything you need to do. Don’t worry, we’ve got your back. 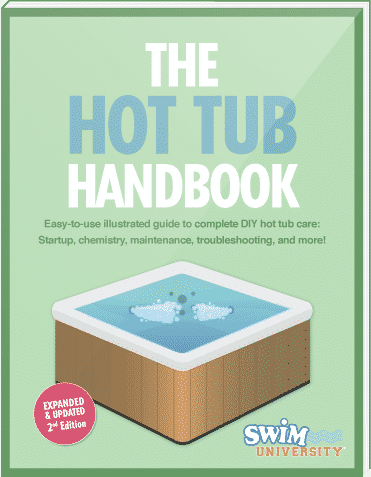 Follow these 12 simple steps to start a hot tub like a pro. If you’re a new hot tub owner, you’re going to have to get used to the cleaning that comes with hot tub ownership. If you’re a more seasoned owner, you know the drill. Many manufacturers ship hot tubs with a small amount of antifreeze just in case they’re exposed to freezing temperatures on the way to your house. It protects the plumbing from any potential damage, but it’s not something you want to soak in. Fill the tub’s footwell—that’s the bottom portion where you place your feet—with water, run the pumps for a few minutes, and then drain. This clears any antifreeze out of your plumbing system. If you’ve left your water sitting for a long period of time with no maintenance, you need to drain and clean your hot tub to get rid of the old water and any bacteria colonies that could make you sick. After draining, refill the tub with new water. Choose a good jet and drain cleaner, and follow the instructions on the package. Allow the jets to run long enough to do a thorough cleaning job. Once your jets and drains are clean, drain the hot tub again. We’re big on safety here. Before you do any major cleaning you should always disconnect all power to your hot tub to prevent any shocking mistakes. This doesn’t mean simply flipping your spa equipment switch. Unplug your tub and turn off the circuit breaker to ensure the power is completely cut off. Remember, water and electricity to not mix. You wouldn’t bathe in a dirty tub or shower, right? Well, you don’t want to soak in a dirty hot tub either. Keeping your spa clean is pretty much a third of the maintenance along with water chemistry and hardware upkeep. When you first start a hot tub, you want to make sure all the surfaces that water may come into contact with are as clean as possible. 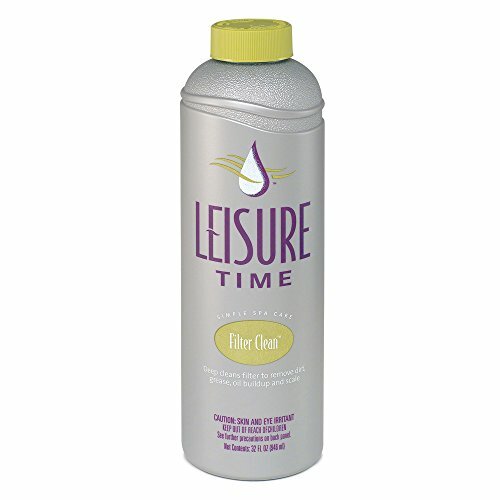 Spray and wipe down the shell (that’s the actual tub of your hot tub) and the cover. Use a non-abrasive cleaner and a soft cloth or sponge to prevent any damage to your shell. Rinse thoroughly to keep your hot tub from foaming later. If your spa sat with stagnant water in it for a while, it’s a good idea to perform a hot tub deep clean to get it back to usable status. Your hot tub filter plays a crucial role in maintaining the cleanliness of your water. This is the best time to install new filters or clean your old filters. 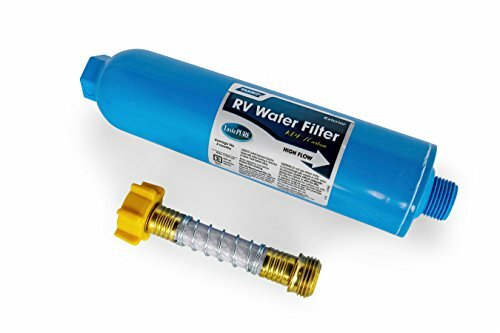 Install a filter cartridge into every filter well. Some hot tubs only have one, but check your owner’s manual just to be safe. Remove and inspect any filter cartridges currently installed. Check them all to see if they need to be replaced. If they’re just dirty, you can clean the hot tub filters by spraying them down with filter cleaner. If they’re extremely dirty, put them in a chemical soak overnight. Actually, it doesn’t matter if they look dirty or not, it’s safer to clean them anyway. Once the filter cartridges are clean, inspect them one more time in case they need replacing before reinstalling them into your filter wells. Whether you’re filling your hot tub for your first or fiftieth time, we also recommend you use a hose filter If you click this link and make a purchase, we earn a commission at no additional cost to you. . It will help remove any impurities from your water source, including high mineral levels (which can clog your system), metals like copper and iron (which can turn your water green or brown), and calcium (which can cause buildup in your shell and plumbing). Hose filters prevent mineral and metal problems before they start, which can save you a lot of time and money. Even with a hose filter, we recommend placing the hose into the filter well. This lets the water circulate through the system and push out any air locks (air stuck in the plumbing). If you don’t have a hose filter, the next best thing is to place the hose directly into the filter area rather than the footwell. You’ll get the filtering benefits from the hot tub’s filter, and will still head off any air lock problems. Your owner’s manual may have specific instructions on how high your water level should be, but generally, you want the water level to be about an inch below the headrests while still being high enough to fully cover the jets. Try to resist the temptation to add a little more water. When you, your family, or your guests enjoy the tub, the water level rises. If you spill water, it can throw off the balance of your hot tub chemistry, which means more work for you later. Plus, if your hot tub is indoors, you’ll have a slippery mess. You also want to make sure your water level is high enough. Low water levels can cause your heater and pump shut down, which means no outflow from the jets and less filtration. Plus, if you live in a colder climate, your water might not circulate properly and your pipes could freeze. Air in your hot tub’s lines can cause a whole slew of problems. To make sure air is out of everything, you need to prime the hot tub pump. This process varies depending on the manufacturer and model, so consult your owner’s manual before proceeding. Some control panels have a self-priming mode. If yours doesn’t, you’ll have to prime it manually using a bleeder valve. Press the jets button to turn the pump on. Run for ten to twenty seconds. Press the jets button again to turn the jets on high. Run for another ten seconds, and make sure all the jets are working. Turn off the jets by pressing the jets button again. Continue to repeat this process until water circulates through all the jets. You’ll know the pump is primed if all the jets are working as they should. Make sure all power is disconnected from your hot tub by turning off your spa and the breaker. Locate your hot tub’s pump. If you’re unsure of its location, check your owner’s manual. Close the gate valve on the discharge side of the pump. This shuts off the water flow. Turn the bleeder valve counterclockwise until you hear it start to hiss. That’s air leaving the pump. All the air has been released when the hissing stops. Once all the air has escaped, tighten the bleeder valve, reopen the gate valve, and turn the hot tub power on. Turn on the jets to check whether the water is flowing properly. Repeat the process until the pump is primed and water is flowing normally. Turn all of your jets’ faceplates counterclockwise to open them. Keep the heater off by turning down your thermostat. Press the jets button twice to turn the jets on high. Let them run for ten to fifteen seconds. Turn off the jets. Repeat the previous step three more times, increasing the run time by ten to fifteen seconds. You will start to see air bubbles coming from the jets. Keep the jets running until all the air has been released. Now that your filters are clean and installed, your water is fresh, and your pump is primed, it’s finally time to add your start-up chemicals. Wait until your hot tub water reaches 80ºF (30ºC) before you add anything. The heat helps the chemicals dissolve and incorporate into the water. Figure out how much water your hot tub holds. You can find usually this in your owner’s manual. The amount of water in your tub determines the amounts of chemicals you need, so this is important. Measure your chemicals before pouring them into the tub. It helps keep your water chemistry balanced and will save you money in the long run. Keep your chemical measurements separate before pouring them into your tub. Mixing chemicals outside of water can be dangerous and less effective. Important: Do not use pool chemicals in your tub. 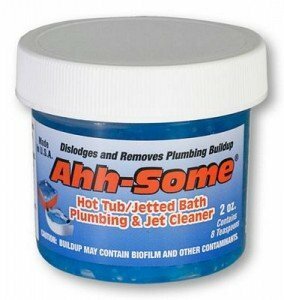 Chemicals made specifically for hot tubs are your best option. Once your chemicals are added, run the pump for at least ten minutes on high speed. This evenly distributes the chemicals in the water, and will give you a more accurate test result. If you’re a new hot tub owner, get ready to discover the high school chemistry throwback that is testing your hot tub water. You may have measured the chemicals, but you should always check to make sure your chemistry is correct. If your chemistry is off, it can damage your hot tub, irritate your skin, or allow nasty bacteria to invade your relaxation time. If you’re a new hot tub owner, and you’re not sure how to test your hot tub water, don’t worry. It’s not as difficult as it may seem, and you’ll get the hang of it in no time. We also recommend you plan to test your hot tub water at home once a week and have your water professionally tested at your local spa supplier once a month. Some like it hot, and some like it hotter. You should find the temperature that’s most comfortable for you, but we recommend keeping your water between 98ºF and 102ºF (36ºC and 38ºC). Caution: Your water temperature should never, ever exceed 104ºF (40ºC). You could burn yourself or damage your hot tub, or both. While your hot tub control panel has a thermometer, we recommend you test your water with a separate thermometer to ensure an accurate reading. We also recommend that you keep your water’s temperature consistent. If you let your water cool off and reheat with every use, you run the risk of stressing the heater and circuit board. Not to mention, you’ll waste a ton of energy and get a higher electric or gas bill. Let your water circulate for another ten minutes after you set the temperature. Cover your tub for approximately twenty-four hours. This helps the temperature rise, retain heat, and prevent loss of water and chemicals through evaporation. No, we’re not just repeating ourselves. Now that your water has had some time to stabilize, the chemical levels may not be correct. Before you use the hot tub, test the water a second time and adjust chemical levels as needed. 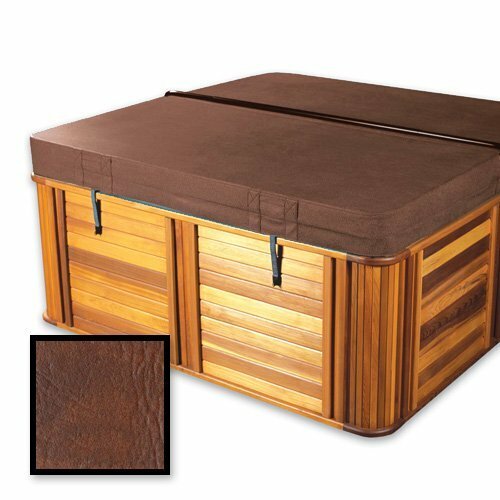 When you start a hot tub after a long break, inspect your hot tub for any cracks, stains, or mildew. Dampness may disguise damage, so it’s important to wait for your tub interior to dry completely before looking it over. Be sure to also take a peek at the wiring before you refill. If you see any frayed cords or loose connections, call a qualified electrician to inspect it. Unless you’re a licensed electrician, working with electrical systems is best left to a professional. You’ve successfully started or restarted your hot tub. We told you it wasn’t that complicated. As a reward, sit back, relax, and let your troubles float away in your hot tub.